Carvers at work during a previous Thanksgiving Day supper. The purpose of the 11th annual National Hunger and Homelessness Awareness Month, proclaimed by the city council and organized by the Housing and Human Services committee, is to enhance community awareness of the issue in society, our own hungry and homeless in Laguna Beach, and the community organizations that assist the homeless and hungry in Laguna Beach and Orange County. The community can participate in numerous ways. Two films will be shown at the Susi Q Community Center, 380 Third Street. On Wednesday, Nov. 7, at 3:30 p.m. see “The Florida Project.” Set over one summer, the film follows precocious 6-year-old Moonee as she courts mischief and adventure with her ragtag playmates and bonds with her rebellious but caring mother, all while living in the shadows of Walt Disney World. On Wednesday, Nov. 21, at 3:30 p.m. see “Dark Days,” Marc Singer’s documentary about the homeless population who live in the underground tunnels of New York City. Contact Jheri St. James at 949-494-5031 or [email protected] more information. Members of the public can also donate gently used winter clothing at Laguna Exchange, 995 S. Coast Highway, during the month of November. Hours are 11 a.m. to 5 p.m. Sunday-Thursday and 11 a.m. to 6 p.m. on Friday and Saturday. The Girls Scouts’ toiletry drive runs Nov. 1-18. The community can participate by donating unused toiletry items and socks benefiting the city’s Alternative Sleeping Location, which provides the homeless temporary nightly housing and other services year-round. For a list of drop off locations, contact Missy Palino at 949-322-0470 or [email protected] Sample sized shampoo, sunscreen and deodorant, lip balm, disposable razors, feminine products, Band-Aids, washcloths, and toothbrushes are appreciated. The cityof Laguna Beach and Waste Management are also sponsoring a month-long food drive benefiting the Laguna Food Pantry, which provides free, fresh groceries to more than 300 local families in need each week. Located at 20652 Laguna Canyon Road, the pantry is open from 8:30 a.m. to 10:30 a.m. Monday through Friday. Food collection sites include U.S. Bank at 310 Glenneyre St. near Forest Avenue, plus many of the city’s churches, public and parochial schools, and Anneliese schools. New volunteers are always welcome. 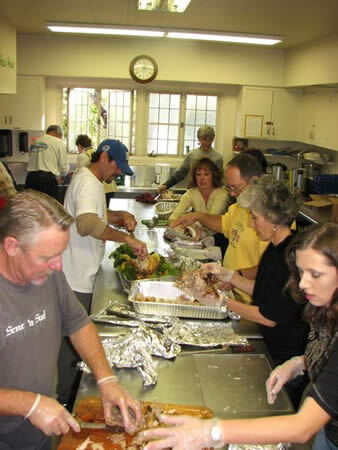 For more information, call 949-497-7121 or visit www.lagunafoodpantry.org.Items most in demand are peanut butter and jelly, canned tuna, cereal, pasta and sauce and rice and beans.